This delicious oven fried chicken recipe combines two of the best tastes of the south, chicken and pecans. It is oven baked but still crunchy like regular fried chicken. The buttermilk ensures that is is very tender, while the cayenne and herbs provide a wonderful savory taste. Combine the flour and seasonings in a shallow dish. Pour the buttermilk into another shallow dish. Combine the pecans and cereal in a third shallow dish. Spread the butter in a 15 x 10 inch jelly-roll pan. Dip the chicken pieces first into the flour mixture, then into the buttermilk. Let drain slightly, then dip into the pecan mixture, turning to coat well. Arrange the chicken in the jelly-roll pan. Bake, uncovered, at 400°F for about 50 minutes, until the chicken is golden, crisp and tender, turning once after 25 minutes. Drain on paper towels. This is a recipe from one of those amazing Gooseberry Patch cookbooks, Autumn in the Country . The crunch coating comes from a mix of crushed cereal and chopped the pecans, giving this recipe an added hit of amazing flavor. 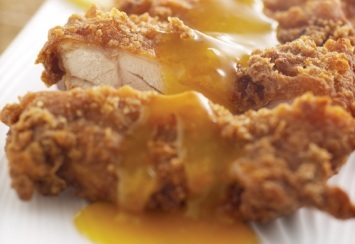 Oven “frying” makes this chicken healthier than deep frying. I just love this recipe. If you like it too, I’d love you to Pin it to Pinterest, Tweet about it, Like it on Facebook and leave a comment and your favorite recipes below. I think you will love this oven fried chicken recipe. If you want a fried chicken recipe that tastes like Kentucky fried, look here.